We're continuing our tour of the Lehigh Valley area with this small inner-city CTown supermarket operating in a former Save-A-Lot. I know a lot of people dislike CTown but in my experience CTown has been a consistently good urban supermarket. All of the stores I've been to have been clean and well-stocked, with excellent prices. This one was no exception. CTown seems to have gutted the store when they opened and despite the store's strange layout and size (it's six aisles, but extremely deep), it's a very nice store. All the fixtures, flooring, and shelving seem to be newer than 2001, pointing to either an extensive later renovation or a later opening date. Contrary to what the store's sign would have you believe, "La Tiendona del Pueblo" does not translate to "Supermarkets for Savings". 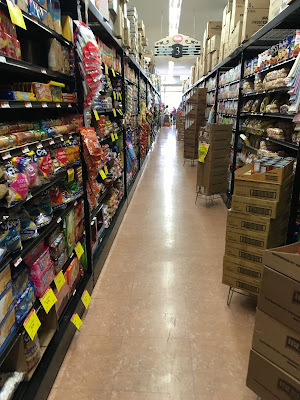 "La Tiendona del Pueblo" means "The Superstore of the Town (or the People)". This store is owned by Juan Diaz, who also owns the CTown in Bethlehem and formerly the Easton Food Market. Heading inside, we are greeted by a small but well-stocked and compact produce department. Note the updated floors, shelving, and aisle markers (although quite a few aisle markers were missing either a number or product). Normally, my pictures focus mainly on the store's perimeter, but there's so little perimeter here! The last aisle contains frozen and dairy, with fairly new cases. You might think the store was empty based on these pictures, but it was actually quite busy. There were a lot of people coming and going, although there were also quite a few doing larger shopping. In the above picture, we're looking towards the back of the store. The deli department is directly behind me, as are the checkouts. The front-end was too crowded to get a picture of. I'm assuming the black space to the left is the future home of another. Almost the entire side wall had murals along the bottom. While I wouldn't call the Allentown CTown a tourist destination, it's definitely a solid supermarket for the neighborhood.